Last week Republicans accused Democrats of doing what they did just the week before regarding Jerusalem. Unlike the Republicans, the Democrats clarified their position by amending the platform, resulting in a statement on Israel that is stronger in several respects than the Republican platform. The voice vote was messy, but far more problematic was the Republican tribute to Ron Paul, the most anti-Israel candidate to run for president in decades, and the GOP decision to let Rand Paul, who supports cutting foreign aid to Israel, address their convention in person. Rational pro-Israel voters should not base their 2012 votes on Jerusalem because both parties have the same position. As many of you know, I was a delegate from Illinois at the Democratic National Convention last week. After Shabbat services yesterday, many people approached me during kiddush lunch with questions. This article will be longer than usual. If these issues are important to you, I hope you’ll take the time to read to the end. Ron Kampeas accurately summarizes what happened. Republicans attacked Democrats for not including certain language on Jerusalem and when Democrats added the language back, the voice vote did not go smoothly. We first need to separate politics from policy. The Democrats kicked the ball into their own goal. This entire firestorm could have been avoided if someone had done what the Republicans did the minute they had a chance: compare the 2008 platform to the 2012 platform for emotional issues. We’ll talk below about the policy rationale for not including the Jerusalem language, but not initially including it created an unnecessary distraction. The Democrats then scored another goal against themselves with the voice vote. We’ll talk below about why it went down the way it did, but the optics were terrible. Should any of this matter to pro-Israel voters? That’s where policy comes in. To understand the Democratic platform on Israel, one first has to understand the Republican platform on Israel. This election is a choice, not a referendum. I was not able to find a link to only the Israel part of the Republican platform, but here is a link to the entire Republican platform. Scroll down past the part about how taxes reduce freedom, past the part about repealing the estate tax, past the part supporting a Constitutional amendment requiring a super-majority for any tax increase, past the part supporting a Constitutional amendment restricting marriage to unions of one man and one woman, past the part supporting prayer in public schools, past the part supporting a human life amendment to the Constitution and legislation to make clear that the Fourteenth Amendment’s protections apply to unborn children, past the part opposing federal funding for embryonic stem cell research, past the part about reining in the EPA, past the part about saving Medicare by “modernizing” it (I’m not making this up), past the part about repealing Obamacare, and you’ll eventually get to a section titled “American Exceptionalism.” The last two parts of that section talk about Israel. Most Democrats would probably agree with the 2012 Republican platform on Israel. I certainly do. Everything in the Republican platform on Israel is fine, but in 2008, the Republicans also said this: “We support Jerusalem as the undivided capital of Israel and moving the American embassy to that undivided capital of Israel.” Now that language is gone. Now let’s look at the pre-amended Democratic platform. Once again, you’ll have to scroll down to get the Middle East section. The Democratic platform is very strong on Israel; in many ways, it describes how President Obama has already done what the Republicans say they want to do. But it too is not the same as the 2008 platform. Specifying military force explicitly is new — the Republicans fall back on the coy “all options” language, which is interesting because that elision has frustrated pro-Israel groups and Republicans and Democrats in Congress no end in the last year, and helped bring about more explicit warnings from the White House, culminating in the explicit mention of “military force” in the DNC platform. But what about Jerusalem? As Josh Rogin reported, “the drafters [of the platform] made a deliberate and conscious decision to reframe the Israel section of the platform around Obama’s record, to limit the section to cover his existing policies, and to intentionally avoid any and all final-status issues.” That might not be how to win US elections, but it does make sense. But what about other language that was not added? Republicans also complained that language about Hamas in the 2008 platform is not in the 2012 platform. Robert Wexler responded that the 2012 platform is stronger because it covers all Palestinian terror groups: “The platform doesn’t say ‘Hamas,’ but it says that any potential Palestinian partner has to meet the conditions necessary for peace. That’s even stronger and of course it applies to Hamas.” President Obama’s position is clear on the refugee issue and the armistice lines issue, both of which are final status issues that are not necessary to include in the platform. The voice vote was blown out of proportion. I knew in advance that the platform would be amended at 5:00. Do you know where I was at 5:00? I was having dinner at Bentley’s with most of the Illinois delegation. It was a done deal. Many of the people there at 5:00 weren’t even delegates and had to get there early because they didn’t have reserved seats. When C-SPAN wasn’t zooming in on those two Arab-Americans, they showed the main floor, plainly revealing how few people were there. The Illinois section was virtually deserted. Why the booing? Some delegates were upset because they had no notice of the amendments (they didn’t). Some delegates were upset because the “under God” language was also being added (it was). And yes, there probably were some people upset about the Jerusalem language, but it’s impossible to know how many of the nays and boos were actually from delegates. What we do know for certain is that Democratic leadership strongly backs the Jerusalem language. I was at an AIPAC lunch earlier in the day, and Senator after Senator, Congressperson after Congressperson, re-affirmed their support for Jerusalem as Israel’s capital. And this being the Democratic Convention, all of them were Democrats. Republican delegates exhibited anti-Israel sentiment only a week earlier. The voice vote at the Democratic convention was ambiguous, but you don’t have to guess what Republican delegates supported. Rep. Ron Paul is the most anti-Israel candidate to run for president in either party for decades, maybe ever. Yet Ron Paul was honored at the Republican convention, no doubt to appease the Ron Paul delegates who were elected during the Republican primary. And Sen. Rand Paul, who is not quite as extreme as his father but who does favor cutting foreign aid to Israel, spoke at the Republican convention. Can you imagine the outcry if a Democrat who supported cutting foreign aid to Israel spoke in person at the Democratic convention? The Jerusalem issue defies logic and rationality when it comes to our presidential elections. Presidential candidates say all kinds of things in order to win elections, including repeated commitments to move the U.S. Embassy from Tel Aviv to Jerusalem. And then, once in office, they turn around and seek ways to avoid doing it. Despite all of the campaign rhetoric, no administration has changed the bottom line U.S. position on the embassy, or for that matter the status of Jerusalem, since 1967. Its fate is to be determined in negotiations. And here’s a news flash for you. Should Mitt Romney become president and serious negotiations start between the Israelis and Palestinians, his position would conform to that of his predecessors, and might even go further to allow for Palestinian sovereignty in east Jerusalem. Debbie Wasserman Schultz spoke accurately about Michael Oren. I was in the room when the DNC Chair said “We know, and I’ve heard no less than Ambassador Michael Oren say this, that what the Republicans are doing is dangerous for Israel.” I don’t know if the “reporter” stayed for all of what she said, but it was obvious to me, as it should have been obvious to anyone familiar with Oren’s warnings about using Israel for partisan gain, that she was right. Republicans have repeatedly attempted to use Israel as a partisan issue. Whatever Romney meant when he said he’d “do the opposite” of President Obama on Israel, there is no way to interpret his statement as anything but the opposite of bipartisanship. And if accusing President Obama of “throwing Israel under the bus” even as Israeli Defense Minister Ehud Barak called US military and intelligence support for Israel under President Obama unprecedented isn’t playing politics with Israel, I don’t know what is. So while it’s true that Oren did not specifically call out Republicans, it’s also true that Republicans are engaging in exactly the behavior that Oren so rightly condemned. I was in the room. It was obvious that’s what Wasserman Schultz meant. And good for her for speaking up. But what about the troop exercises? Someone asked me about this in shul too. Some have suggested that the US is sending Israel a signal because the number of US troops participating in an upcoming major joint military exercise with Israel is smaller than originally planned. The reality is that the exercises were moved at the request of Israel from the spring to the fall. At that time the administration told Israel that if the date was changed, then due to troop rotations the number participating would be a bit smaller. Time reported that only 1500 US troops would participate, but the actual number is about 3,000. 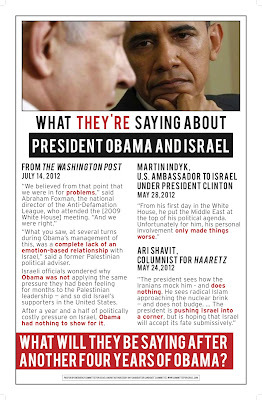 Crossposted courtesy of Steve Sheffey’s Chicagoland Pro-Israel Political Update. The motivation behind the so-called Emergency Committee for Israel’s newest ad can be summed up by its last line’s inclusion of ‘President Mitt Romney.’ If their previous behavior — including one of their founders appearing at a Romney fundraising retreat — wasn’t enough to show that their focus is only about electing a Republican president, then their cover is certainly blown today. ECI is not concerned with supporting Israel or adhering to the long-standing norms of the pro-Israel community. The Emergency Committee for Israel is a fraud — plain and simple. What’s more, ECI’s top leader William Kristol publicly said recently, ‘I’m happy to sit here and agree with President Obama to a considerable degree’ about Israel — further evidence of the cynicism of their campaign to elect a Republican. And when it comes to Jerusalem, the position they’re criticizing is one carried out of course by the Bush Administration, and administrations before it as well. Given their long history of lying, ECI’s ads should be rejected by networks and ignored by voters. 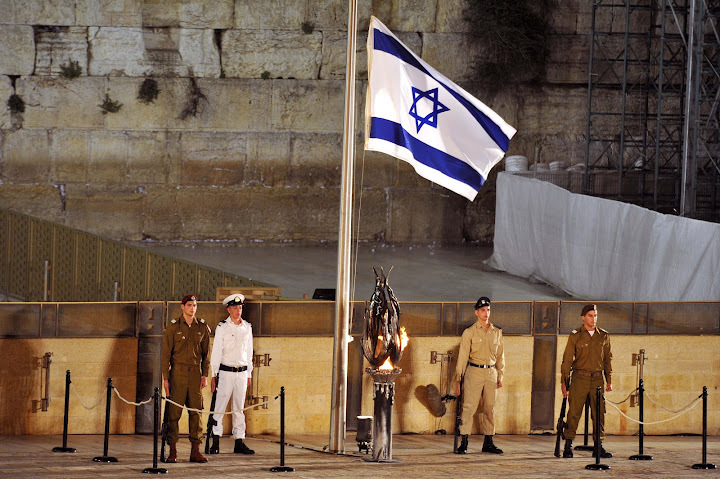 Above left: The remembrance ceremony at Jerusalem’s Western Wall honoring Israel’s 22,993 victims of war and terrorism. Above right: Cartoon courtesy of Yaakov (Dry Bones) Kirschen www.DryBonesBlog. blogspot.com. On the 64th anniversary of Israel’s independence on April 26, I wish to extend warmest regards and congratulations on behalf of the American people. Based on shared values and interests, the bonds between our two countries are deep and strong. In a time of momentous change, the United States remains steadfast in its commitment to Israel’s security and a comprehensive peace in the region. As we work together to pursue common goals and meet shared challenges, I wish the State of Israel continued prosperity and a peaceful future. CAMERA and many others routinely expose the subterfuge at the heart of The Guardian‘s coverage of Israel. This deceit was clearly demonstrated in a correction issued for a photo caption appearing on April 20 which inadvertently revealed that Jerusalem was the capital of Israel. Israel’s Knesset and government resides in Jerusalem. That is a material fact. The Guardian could have remained consistent with its hostile stance towards Israel by stating that the paper does not recognize Jerusalem as the capital of Israel. But to deny reality by stating that Tel Aviv is the capital, when it demonstrably is not, provides an example of a news source allowing dogma to overrule physical reality. It is even more ironic that the photo caption dealt with the Holocaust, an incontrovertible reality subject to denial by individuals inimically hostile to Jewish interests.